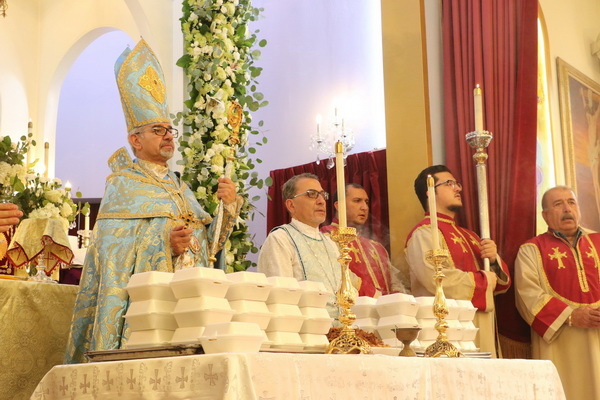 On Sunday, November 4, 2018, the name-day and 55th anniversary of the consecration of Holy Martyrs Church of Encino was celebrated with Episcopal Divine Liturgy and blessing of madagh. H.E. Archbishop Moushegh Mardirossian, Prelate, celebrated Divine Liturgy, delivered the sermon, and conducted the blessing of madagh. Archpriest Fr. Razmig Khatchadourian and deacons assisted at the altar. Alongside faithful, delegates, board members, and ladies guild members, Sunday School students and representatives of sister organizations were in attendance. Prior to the sermon, the Prelate congratulated the parish family and prayed for the Lord to keep the Church unshaken and those who worship His name in peace and faith. His Eminence delivered the sermon on the Feast of All Saints, which was observed the day prior and is the name-day of Holy Martyrs Church, and on the day’s Gospel reading from Luke 12:17-21, in which Christ affirms, “My mother and my brothers are these who hear the word of God and do it.” The Prelate noted that the feast is dedicated to all saints, old and new, known and unknown, who followed Christ at all cost, who not only heard but implemented His Word, who lived and served with unwavering faith and now rest in His presence. His Eminence stated that throughout history, and in the early days of Christianity especially, those who professed their faith in Christ and confessed Him as their Lord and Savior were often met with martyrdom. The Christian life is a life of eternal pilgrimage, and the purpose of that lifelong journey is to resemble Christ and live in His image, he said, adding that we have before us countless witnesses and martyrs for the faith whose life we must emulate. Furthermore, we must seek their intercession and prayers, so that in the face of adversity we may remain steadfast in our faith journey. In this day and age when worship of false idols and a spirit of self-centeredness and egoism is rampant, when goodness and decency is in decline, we must follow the example of our saints and instruct the new generations with the right values and principles, he stressed. “Today, first and foremost, is an opportunity for the renewal of our confession of faith. Our witnesses, martyrs, and saints collectively invite us to remain faithful to their legacy, to renew and strengthen our faith, hear and fulfill the Word of God, follow in Christ’s example and become more Christ-like by inviting Him to reside in our hearts and souls, to live in His presence and according to His will,” stated the Prelate, who concluded by urging all, clergy and laity, to live and serve inspired by the unwavering faith and courage of our saints, with sincere faith and goodness guided by the commandments of our Lord, for He is the way, the truth, and the life. At the conclusion of Divine Liturgy, the Prelate presided over the requiem service and conducted the blessing of madagh in memory of all departed servants of Holy Martyrs Church, including previous Pastors, Delegates, Board of Trustees and Ladies Guild members, altar servers, choir, and Sunday school members. Afterward, a lunch reception was held at “Yeghia Sarafian” hall with the participation of the Prelate and parish family members.